We know a great deal about Hadrian's wall due to the Vindolanda tablets. These are a series of letters written on wooden bases and wax tablets. The ratio is about 15% wax tablets 85% wooden ones. The first of these was unearthed in 1973 and since then, more of these tablets have surfaced, and the search is still going on to this day. 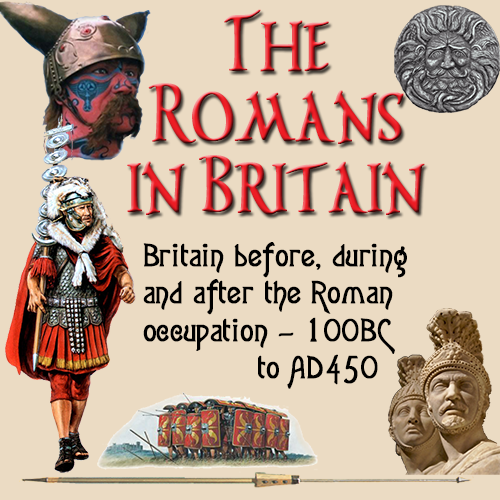 It was while excavations were being carried out at Vindolanda (Chesterholm) at Hadrian's Wall on the English-Scottish border. that the discovery was made. Even before they had been translated, the find caused great excitement amongst archaeologists and historians alike. So far over 2,000 items of Roman writings have been discovered. Who knows what will be uncovered in the future. 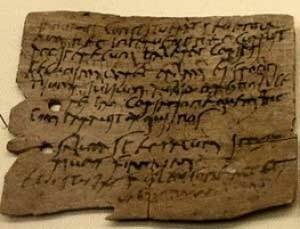 The greatest recent find was in 1993, when another 200 letters were recovered from a Roman rubbish dump. 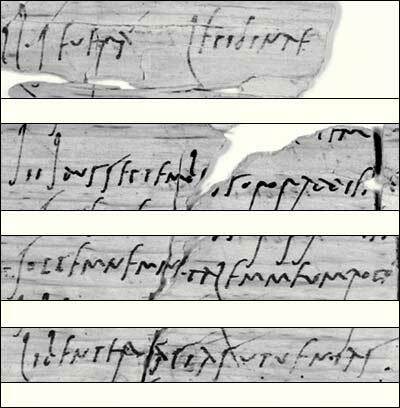 The Romans would burn their rubbish, but these letters survived the fire. As with letters today, the Romans would date theirs, and those found have been found to come from a period between 90 and 125AD. Not all are letters, however. Many are actual military records and accounts from the forts at the site. 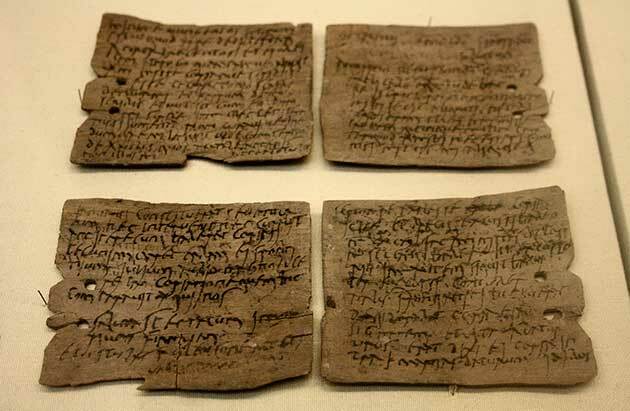 The tablets are about the size of a small notepad some 6-8 inches (15-20mm) long, and 0.08-0.20 inch (2-5mm) thick. They were made of birch or alder wood acquired locally. The writing surface was smoothed and an iron tipped, wooden handled pen was used which was dipped in an ink made from carbon, water and gum. The writing was done in two columns to allow for a folded down the middle later. Once the letter was completed, it was scored between the columns and folded in two. The sending address was then written on the outside. Then were then sealed using wax around the edges. The reason the tablets survived so remarkably well over the years is due to the manner in which they were buried, either by accident or design. They were mixed in with scraps of food and being underground, were subject to a moist atmosphere. This did cause the tablets to discolour, but it did preserve them to a level that archaeologists could restore them to a level where the writing could be read. Forensic experts were called in to establish the best way to restore the writing that had faded and was almost the same colour as the with the tainted wood. They tried various methods on small samples and found that the best way to made the writing readable was to soak them in two baths. The first was a cleaning agent made from methyl alcohol and the second was a preservative of ether. This increased the contrast between the ink and the wood to a level where the original script was visible. To make copies of the writings, they were viewed under infra-red light and the contents photographed. Archaeologists and hand writing experts examined the letters and determined they written in a style of Latin universal throughout the empire. The classic "BBC English" is the nearest we have to this today. Much of the handwriting on the letters differs in sections. This shows that many of them were dictated in stages and written by different people who were copying the spoken words of their masters. Most of the writings are very similar to those we write today. Letters to families back home. Requests to send items. General gossip. It's all there. These are some typical examples of the contents of the letters. "Please send me 20 chickens, 100 apples (if you can find nice ones), 100 or 200 eggs (if they are for sale at a fair price.)" "Let it be clear to you that I am not resigning from either the mess or from the club." "Unless you send me some cash, at least 500 denarii, the result will be that I shall lose what I have laid out as a deposit." "I want you to know I am in very good health, as I hope you are in turn, you neglectful man, who have sent me not even one letter." Even better were the military letters that give insights into the thoughts of those in command. The 'Brittunculi' text ('Brittunculi' is Latin for 'wretched Britons'. "The Britons are unprotected by armour. They are very many cavalry. The cavalry do not use swords, nor do the wretched Britons take up fixed positions in order to throw javelins."